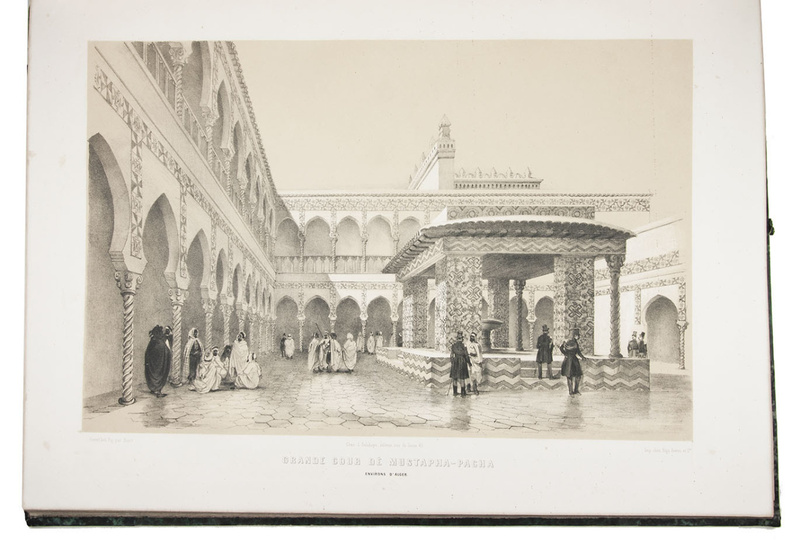 Algerie historique, pittoresque et monumentale, ou Recueil de vues, costumes et portraits faits d'après nature dans les provinces d'Alger, Bone, Constantine et Oran. 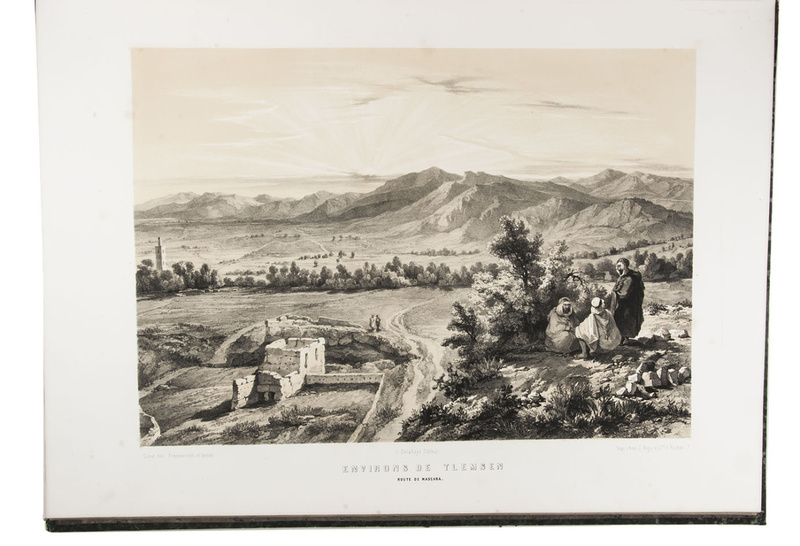 Paris, Delahaye (part-titles: printed by Dondey-Dupré), 1843. 5 parts in 3 volumes. 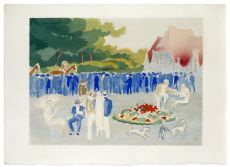 Royal 1mo (57 x 42.5 cm). With chromo-lithographed general title-page, tinted lithographed frontispiece, 2 lithographed maps hand-coloured in outline, and 133 lithographed plates (image size up to 44.5 x 30.5 cm, nearly all non-botanical ones tinted and one with 2 chromolithographed and hand-coloured costume prints) by and after artists including Charles Bour, Eugène Flandin, Félix Emmanuel Henri Philippoteaux and Denis Auguste Marie Raffet. Also with lithographed views (and a few lithographed maps) printed in the tail margins at the ends of many chapters, and 45 white-on-black wood-engravings of coins (each with obverse and reverse) in the text. 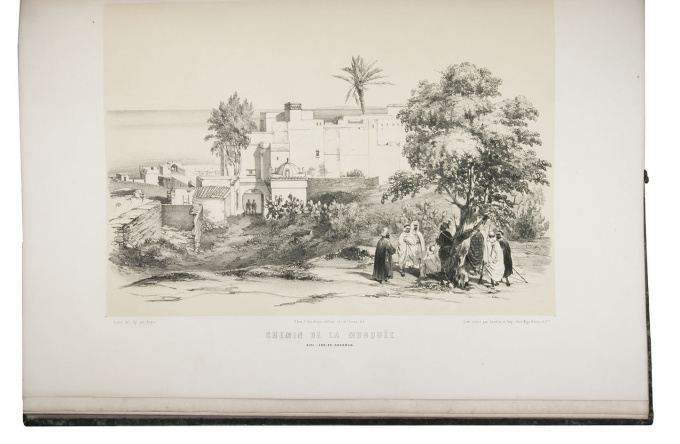 The 72 botanical illustrations on the last 10 lithographed plates are coloured by hand and highlighted with gum arabic. 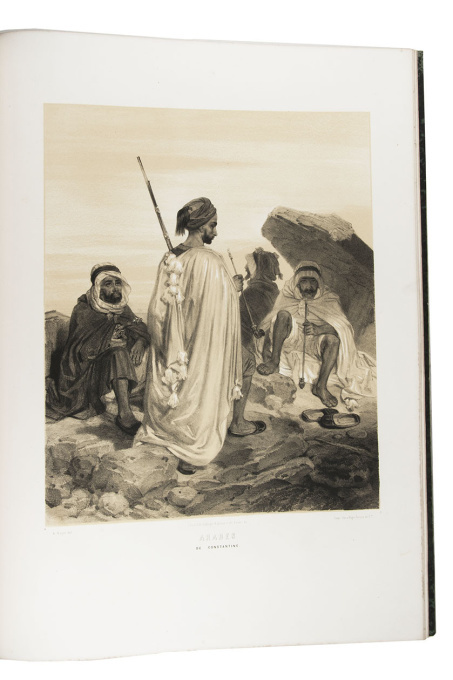 The non-botanical plates have the publisher's embossed stamp in the foot margin. Contemporary, uniform dark green half goatskin morocco with a gold-tooled spine. 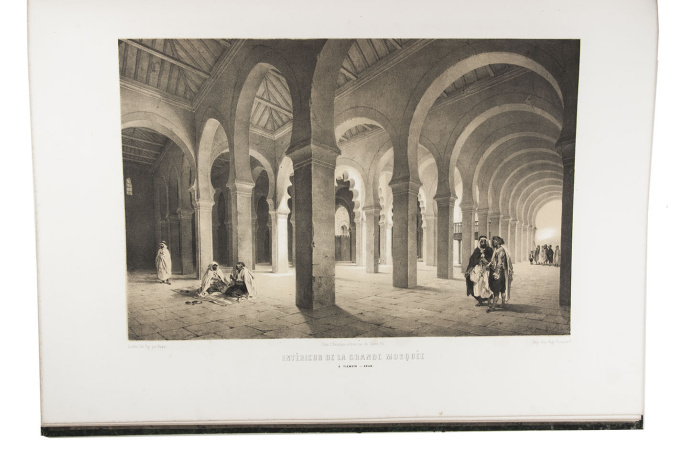 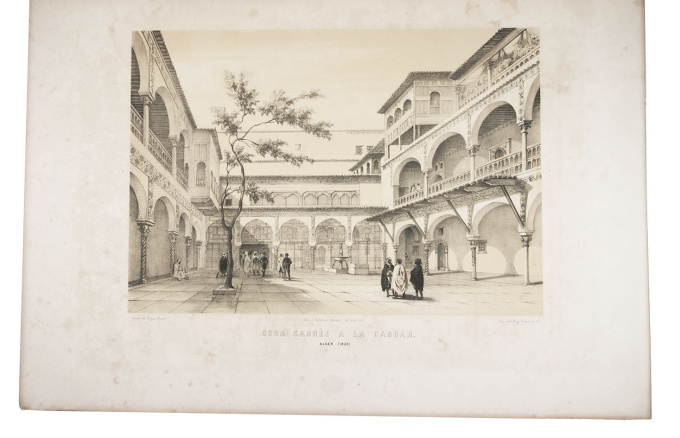 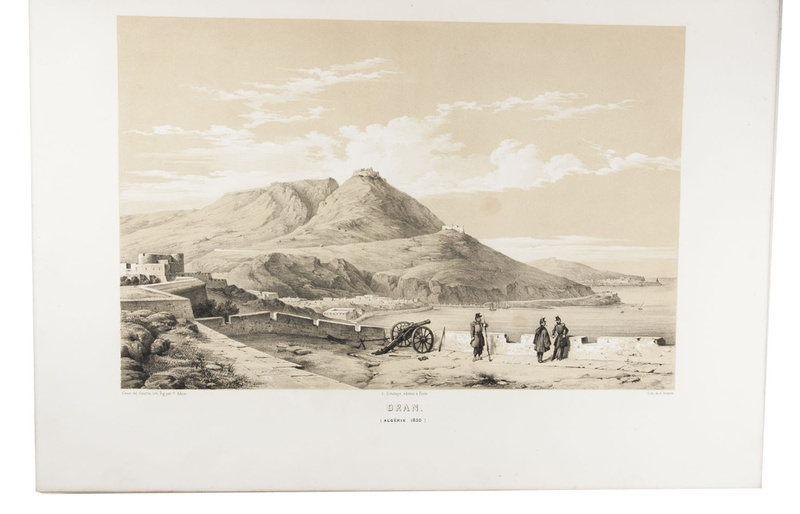 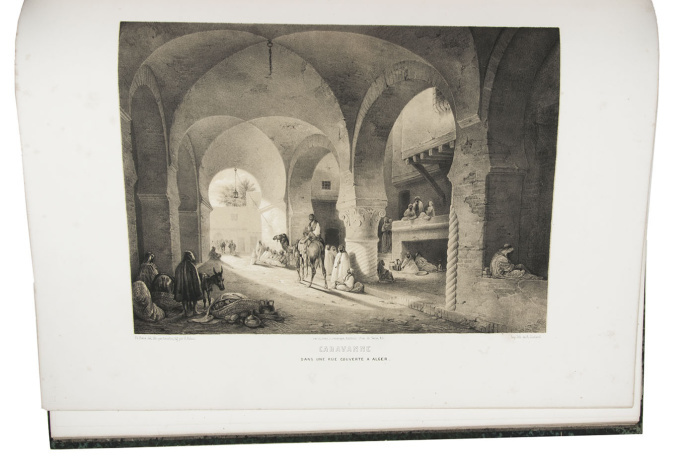 First and only edition of a rare and extensive work on Algeria, with hundreds of stunning and very skilfully executed illustrations, the text by the conservator of the library in the Museum of Algiers, Louis Adrien Berbrugger (1801-1869). 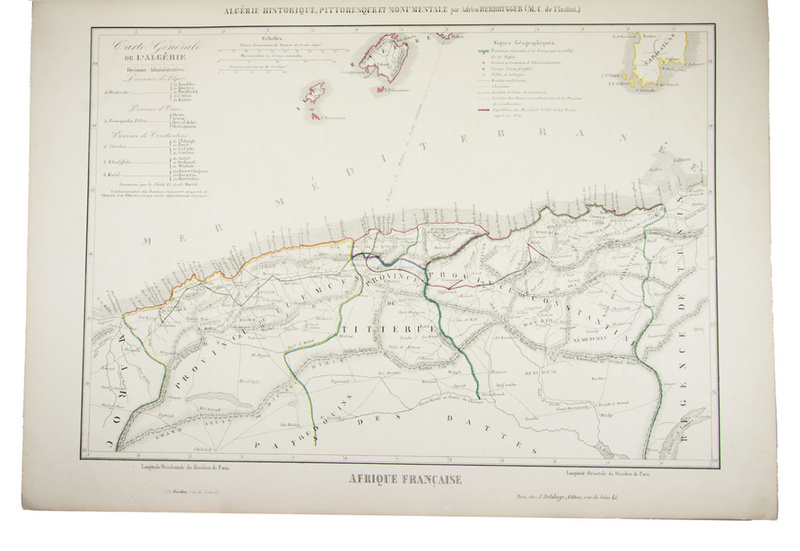 Parts 1 to 4 cover the four Algerian provinces: Alger, Oran, Bone and Constantine, while part 5 is subdivided into ethnic groups (Jews, Turks, Moors, Berbers and some of the nomadic peoples), coins and flora, with the plants arranged according to Jussiau's system. 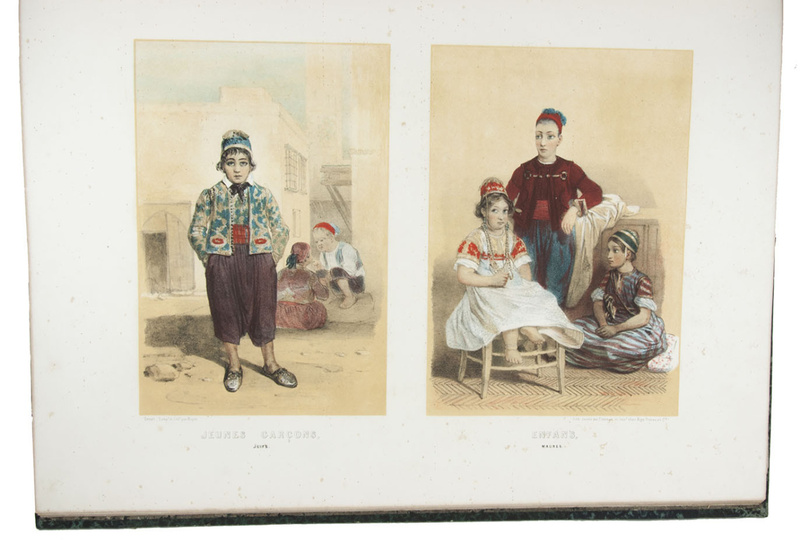 The 133 beautifully executed lithographed plates also show city views, landscapes, portraits, costumes, scenes from daily life with people from a wide variety of professions and various layers of society, etc. 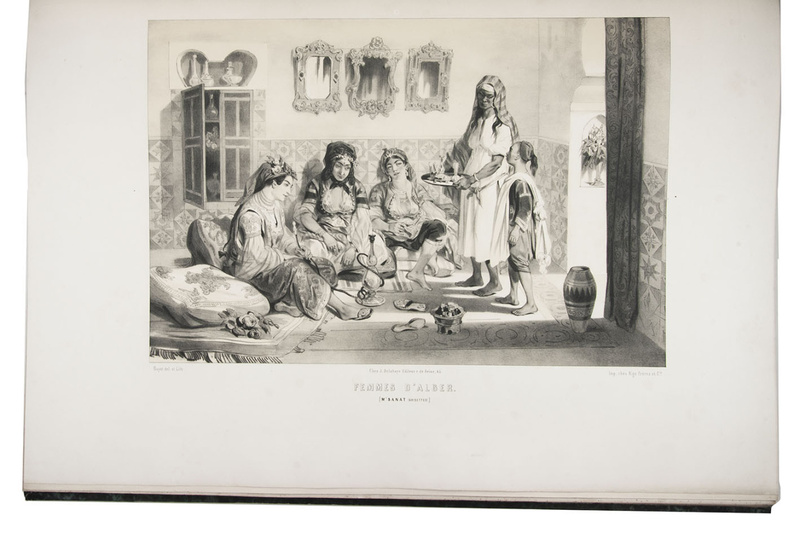 They give a lively and realistic portrait of a country in which many different peoples and cultures coexist. 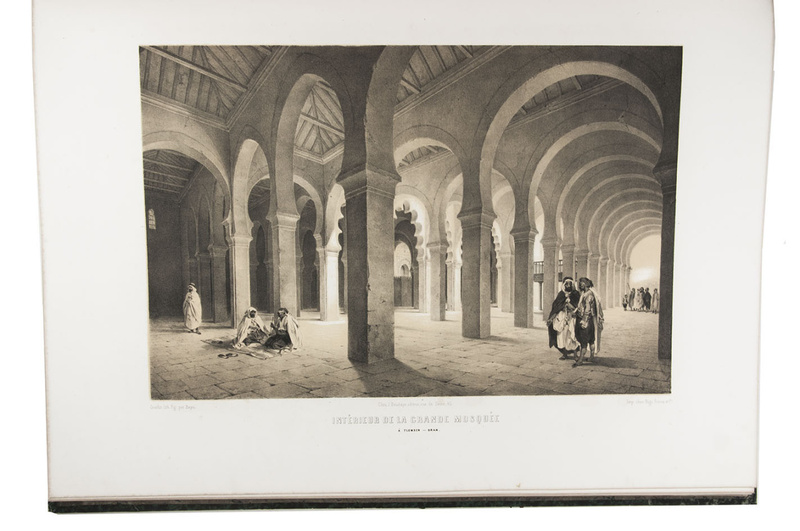 They also show Algeria part way through its gradual conquest by France in the years 1830 to 1848, capturing and preserving images of both the survivals from hundreds of years as an Ottoman state and the early interactions with European society. 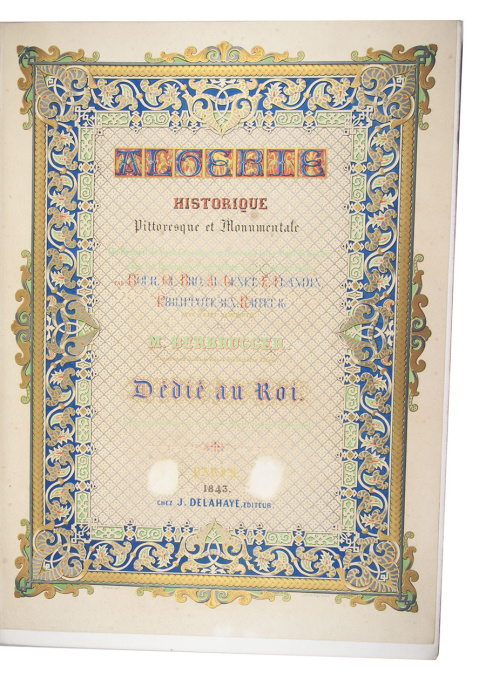 With 2 oval owner's stamps on the general title-page erased, leaving 2 small blank areas in the chromolithographed background pattern, the first botanical plate severely browned, several plates slightly foxed and a couple more seriously. 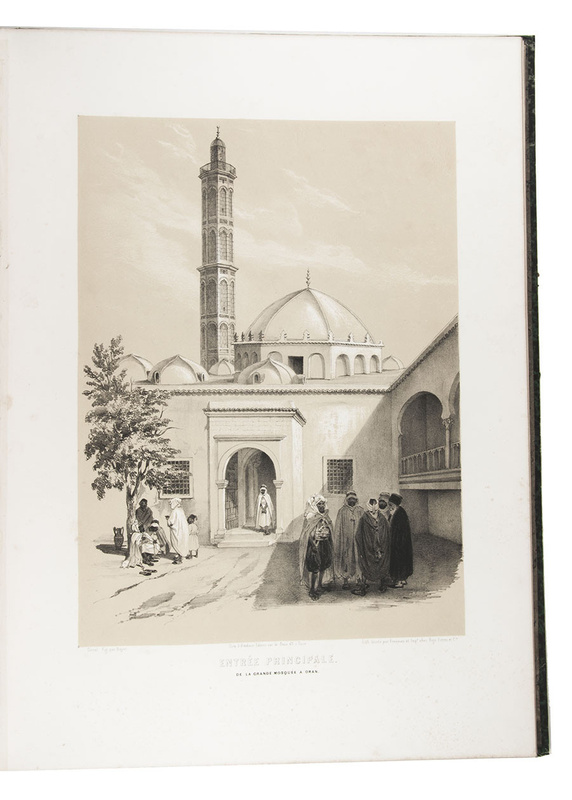 The binding has some small scuffs at the corners and small cracks at the end of some hinges, and the front hinge of volume 3 has some restorations, but the binding is still good. An extensively and splendidly illustrated description of Algeria. 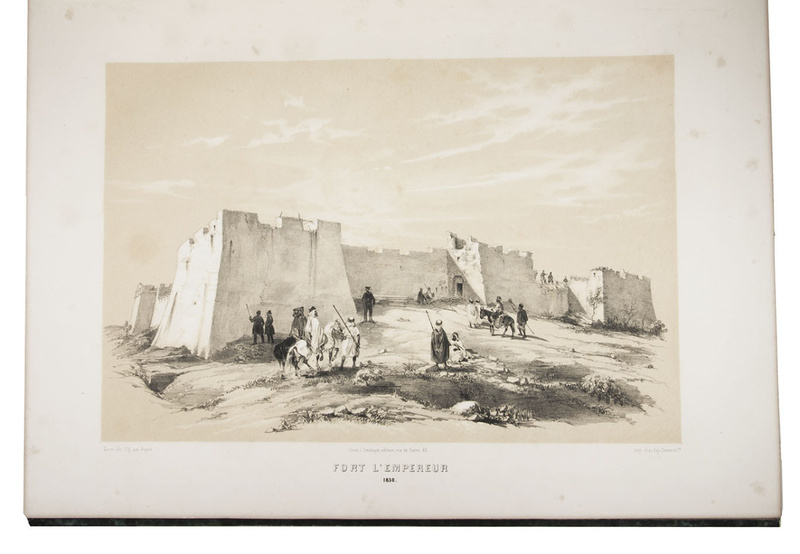 Colas 298; Hiler, p. 81; Lipperheide Ma 23; Tailliart, l'Algérie dans la littérature française, 718; WorldCat (2 copies); not in Atabey; Blackmer.